Legacy Habitat supply electric fencing systems specifically designed to control the movement of rabbits or the components required to create rabbit proof electric fencing systems. Rabbits can be a real pest to landowners and can be damaging to crops or flora in gardens and farmland. Gallagher electric rabbit fencing can provide an effective barrier to rabbit to keep them off your land. Likewise, if kept as pets, an electric rabbit fence enclosure can ensure that the stay where they are meant to be without causing them any harm. 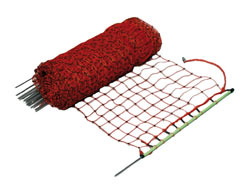 For a temporary, or portable electric rabbit fence system, the Gallagher electric rabbit netting system can be used. This consists of small aperture netting with integrated posts, with ground spikes already fixed to the netting. This system makes it very easy to install, the netting can be rolled out on the ground, stood upright and posts pushed straight into the ground. This makes this system very easy to move, particularly useful for someone who keeps rabbits and needs rotate grazing areas. Each roll is 50m in length and incorporates 15 posts, with ground spikes. Additional lengths of netting can easily be connected together to create a longer fence. The bottom wire of the netting is dead to avoid shorting to ground due to vegetation growth. An energiser suitable for this rabbit netting would depend on how many lengths of netting were connected together. However, for a small netting based system of 100m, the M50 or M120 energisers would be perfectly adequate mains energizers. More permanent electric rabbit fencing solutions can be created using electrified wires at low level, and with narrow wire spacings, fixed to permanent posts with insulators. Systems can also be created by adding a single electrified wire at low level to the ground, to a standard, non-electrified rabbit fence. This would be done using off-set insulators so that the electrified wire stands-off from the traditional rabbit mesh, adding an extra level of defense to the fence.